UPDATE 7/16/18: Ruins Clutter Improved Patch - I added an optional download for Ruins Clutter Improved v3.1 which added anew meshes for the basic plates with a new texture to match. If you were using this mod, my basic plate textures wouldn't display. I therefore created a new texture set to work with the new meshes raiserfx created. UPDATE 7/12/16: Corrected the SMIM tankard textures which had mistakenly been switched with the Beer in Tankards version. This is the only change. UPDATE 7/11/16: Version 2.3 This update adds the revised textures from RUSTIC SILVERWARE as well as modified SMIM textures for the Beer in Tankards mod. The silverware is now more dimensional and reflective in game. The tankards had an issue with the handle part of the texture, so while revising that, I also decided to make them less grungy, and a bit more reflective as well. UPDATE 1/10/16: Version 2.2.1 adds the alpha mask for the Metal Prisoner Cage diffuse texture. Apparently, the mask is necessary if you don't use SMIM, so I added it back. I saved the 4K version as a DXT1A file, so the mask is a 1-bit alpha, which keeps the file size the same as before. For the 2K version (found in the 1K RCC option), I had to save as a DXT5 file, because the stair step nature of the mask is too noticeable at that resolution. Still, it's only a single texture, so it shouldn't really affect performance. UPDATE 1/10/16: Version 2.2 adds the Metal Prisoner Cage textures. Since this is such a large object in the game, I made the diffuse (color) texture 4K (for the 2K version), but I eliminated the alpha mask layer, so it's not as VRAM hungry as the original version would be at 4K. The normal map is 2K, however, so I tried to get the best compromise in appearance vs performance. UPDATE 1/5/16: Version 2.1 adds the Dwemer Lexicon textures (and meshes). I need to add the edited meshes, because the original had poor placement on the corners of the cubes. I made these textures originally for the Aetherial Crown mod that Saerileth is working on, but decided to add them to this mod as well. The original textures are only 512 x 512, and they have 4 different versions of the lexicon on them, so they are quite low-res in the vanilla game. My retextures add a fair amount more detail to these unique items. UPDATE 7/22/15: Version 2.0 adds textures that loosely fit into the "container" category (objects that are used to hold other objects). Included are retextures for the Strongbox (which was previously released by itself), the Safe with Lock, the Knapsack, the Apothecary Satchel, and the Coin Purse. Some of these items were requested specifically by Nexus members. I tried to maintain as much of the original look as possible, while aiming for improve the detail and coloration. UPDATE: Version 1.1 adds retextures for the mead and ale bottles. I never understood why the Nord Mead bottles had blank labels, as did the Ale bottles. I know these weren't supposed to be from the two major meaderies, but some generic "house" label seemed like the logical thing. Anyway, since the Nord Mead and Ale share the same texture, I couldn't add either name to the label, and just went with "Nord" and a couple filled tankards as the graphic. The Honningbrew Mead and Black-Briar Mead bottles and their labels are included. I think you forgot to include the basic plate textures in all your files. Love the pics u posted of it and would like to have them ingame. Please fix if possible and thanks great mod . Funny thing, no such textures exist in the Skyrim Textures BSA file. Perhaps they did in the earlier version of the game, but they don't exist in the current version. 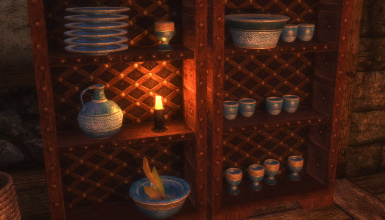 I even looked in an older unpacked folder of Skyrim textures I have, and couldn't find them. I remember making those textures a long while ago, but have no idea what happened to them. 'Tis a mystery. Thanks for quick reply. Where is it currently in your upload then because as it stands i don't see a basic plate as you have pictured? Only plain silver that i have from a different mod under the above file path under basicplate01.dds and basicplate01_n.dds, if i remove those 2 yours still isn't showing what you have pictured for me? OK, I see where the confusion lies..... The mesh is named basicplate, but the texture name is diningset01. The diningset01 texture has the basic plate texture along with the utensils and the wooden plates. That one texture covers several different things. Got it working finally. Both the meshes and the textures came under those file names in a previous texture mod. I believe it came in Ruins Clutter Improved by raiserfx. Anyway it's not showing up for me regardless in the diningset01 texture but it does go purple when i remove previous basicplate01.dds and basicplate01_n.dds. So i removed the basicplate01.nif and basicplate02.nif as well as the basicplate01.dds and basicplate01_n.dds from that mod and went back to the legendary patch of basicplate01.nif and basicplate02.nif and it started working. 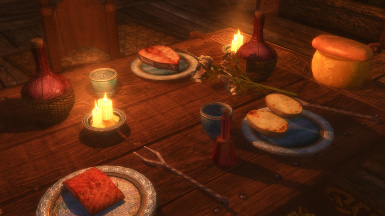 I guess he had his meshes pointing to different textures or old texture paths or whatever so anyone else have Ruins Clutter Improved and want to use this or any other mods that use the diningset01 texture for basic plates remove all 4 lol. Thanks again for all your help. Those meshes are much rounder and nicer than the legendary patch. Is a patch for those basicplate01.nif and basicplate02.nif possible for people using those Ruins Clutter Improved meshes? Or your own basicplate01.nif and basicplate02.nif using your dinerset01.dds Right now the choice is nice round basic plates with mediocre textures or mediocre basic plates with your nice textures. I have Ruins Clutter Improved, and those meshes and textures aren't part of the mod. It must be from some other mod then, but I have no idea what that would be. You must be using an older version. He updated it to 3.1 April 25, 2018 and included those meshes and separate textures check it out. OK, I didn't realize that he had updated the mod. Bethesda did cram a lot onto that one texture, so I can see why someone would want to break it up into separate textures. I'll take a look and see what's involved. If it's a simple fix, then I'll make a patch. Thanks for the patch your awesome. So, looking at the Beer In Tankards patch files, it would seem you haven't touched the drinking animation files as the original mod did. Now I'm no expert, but I'm pretty sure this would likely result in only the clutter tankards sitting around having the rustic texture with beer, and the drinking animation ones would still be vanilla with neither. Do you plan on addressing this? Man, this is such a good mod with amazing retextures, kudos to you! I feel like this is the aMidianBorn Book of Silence for clutter, that's how good it is! I've got a little problem though. Alto Wine has a purple texture in my game. I hear that purple textures point to missing textures. Is it from this mod? If so, any idea on how I can go about fixing it? Thanks again! Purple usually means that either the texture didn't load in your game for some reason, or you've run out of VRAM. If you add more hi-res textures to your game than your graphics card will allow, then you'll have missing textures.... the purple is just the normal map showing in game, but not the matching color (diffuse) texture. I seem to have found the issue though. It was caused by Skyrim 2016 Shaders which adds Environment, Parallax shaders and Reflective cube maps. I think I already said this the first time I DLed rustic clothing. But your textures are amazing, I really appreciate the work you put on these. I've been manually downloading some of your mods to use on SSE but something weird just happened. When I use "add mod from file" on rustic clutter (1k) NMM installs "Ravien - Queen of the Bolt" instead. One of the rustic clothing files is being installed as a random follower mod as well. Is there anything you can do or is this entirely on nexus? Sorry, that must be some weird Nexus server error..... nothing I can do about that. The items are very small, my pc very slow, and your retextures very good. Any chance you could upload a 512p version? This is such gorgeous work. Your mod is truly incredible! SSE Versions of all...... of you mods????? Please!!!! Well at least your most popular mods to start with! Is it safe to use this and overwrite it with Superior Silverware and Realistic HD Beverages ? As long as those mods use the original game meshes it shouldn't be a problem.